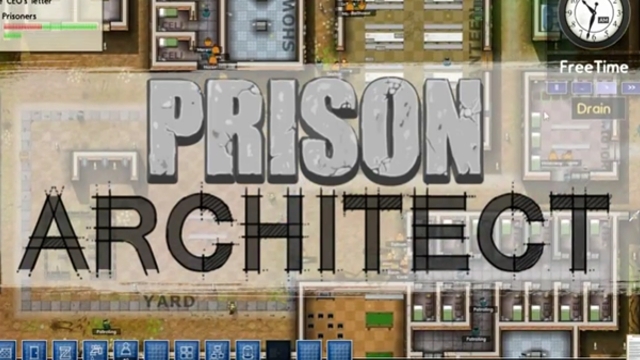 Small, renowned developer Introversion continues to plug away at the alpha for its massive strategy sim Prison Architect, releasing updates on approximately a monthly basis. This feature takes an in-depth look at each new update to describe what it entails and how the new features affect the overall game. If you want to be a part of the alpha and have some input on the game’s development trajectory, visit Introversion’s website to purchase alpha access. Alpha 9 sees a veritable wealth of improvements both big and small, to the point where it’s almost overwhelming when it comes to choosing what to play with first. The most major addition is that of prisoner employments. Now, it’s possible to allocate a Work block the schedule-setting Regime menu, and prisoners can be sent around the prison to perform jobs that would normally be occupied by employees, leading to a better prisoner behavior and a much friendlier financial report. This is an addition that, personally, I really love. Prison as an industry is a mechanic that could really go a long way in Prison Architect, and this is where it starts. Once Labor has been unlocked from the Bureaucracy menu, Prisoners can be put to work cleaning the grounds (which now show dirt and grime with continuous use), cooking, laundering uniforms, or manufacturing things such as car license plates in the Workshop, which are sold at midnight for straight profit. In later alphas, the prisoners will learn skills from these tasks, and will get paid a small amount of money each day which can be spent on goods in a prison shop. This employment mechanism could potentially go a long way for the economically-minded architect. When running low on money, that extra $500 required to keep a cook on the payroll can seem like a lot of cash. A well-behaved prisoner (they can be hand-picked in a later update) can be allocated to the Cooking position for far less. Plates are sold for money. On another level, prisoners that are put to work may be less likely to act violently towards their fellow inmates. However, this could certainly not be the case with some prisoners—each of the Employment rooms, and the items featured within them, will eventually be a source of danger to careless inmates or implements of violence to aggressive ones. Prisoner well-being may very well be strongly affected indirectly as well. When prisoners are assigned to keep up the grounds, trimming unkempt plants and cleaning outdoor walkways, prisoners that traverse these areas may be at peace upon seeing these. A new Cleaning Cupboard room can be built so that prisoners can start performing janitorial services on the (now more detailed) grounds and individual cell interiors. Alpha 9 also adds Visitation. Many prisoners in the facility have family members on the outside who will want to visit them. A new Visitation room and Visiting Table object facilitate this. Presumably, this will contribute to a prisoner’s overall well-being as well as an uneventful time served in the prison. Prisoners can also take visits from their lawyers, if applicable. Introversion promises (threatens?) that in a future update, these visitations may allow family members to smuggle in contraband and weapons for the prisoners. That “search prisoner” button on each Rap Sheet may come in handy…. These additions throw several more balls in the air for architects to juggle. Keeping tabs on prisoner well-being, as well as managing the various employment positions of the inmates, makes micromanagement all the more important. Each new wave of prisoner intake further complicates things, ramping up the difficulty until the whole system is a massive network of items to keep track of. This is definitely a good thing. There are a couple of other minor additions to the game that may not be immediately noticeable but are still good to have. It’s easy to go crazy with building things, which may cause the delivery bay at the front of the prison to get overloaded and congested with materials. Some items, like electrical cables, will now stack on a single spot to save room. Older prisoners have aged faces, food ingredients in the kitchen are stored on the floor in the event of a packed fridge, and things overall look better. As always, technical bugs have been ironed out. This is the alpha to a very complex game, so bugs are going to be expected, and certainly crop up with each successive update. However, Introversion is on top of them, tackling the majority of bugs, glitches and oddities when they appear in each update. That about covers the Alpha 9 updates. The addition of prison employment is a game-changer, and another addition to the monstrous pile of reasons to get in on the game. As always, you can do so by going to Introversion’s website to select from a variety of reward-based tiers, with the base package costing $30. It’s worth it, but if you’re still not convinced, check back here next month to see what is included in the next Alpha update.